A very brief summary of the geography of the area around our village may help to explain the early settlement and distribution of population and so form a background for the following notes on local history. As Map 1 shows, Frieth is situated on the Chiltern Hills about 550 feet above sea level and roughly half way between the river and the scarp slope that the Chilterns make with the plain to the N.W. On this scarp slope the Chilterns drop sharply from about 800 feet to 400 feet in less than one mile but from the ridge to the S.E. and the River Thames the slope is gradual at first, a drop of 400 feet in 8 miles, forming a plateau area. Our village is situated on this plateau area. The geology of the Chilterns is as shown in Map 2. The thick layers of lower, middle and upper chalk are separated by thin layers of hard chalk rock or flints and the whole is overlaid in patches with clay with flints and some sand. Frieth stands on a patch of clay with flints. Some faulting has occurred in the area between Lane End and Frieth. Where water has eroded the chalk to form steep sided valleys the upper chalk and sometimes also lower chalk are exposed on the steeper valley slopes. Springs tend to occur where chalk rock separates upper and middle chalk and where Melbourn Rock separates Middle and Lower chalk, e.g. The Upper Icknield Way follows a line roughly between 500 feet and 450 feet where Melbourn Rock separates Middle and Lower Chalk and forms a narrow shelf. Our own line of springs situated below and parallel to Ellery Rise between Frieth Hill and Perrin Springs occur about the same height. The Chilterns form a natural barrier between the London and Thames Basin and the Vales of Oxford and Aylesbury. Some natural gaps occur where water action has etched steep sided valleys through the chalk. In our area these are the Wye in the Wycombe Valley and the Brook in the Hambleden Valley. Elsewhere the chalk hills are relatively dry except for some small springs. The natural drainage from Frieth Hill is first N.E. to the Moors End - Fingest Road, then W through Fingest and finally S through Hambleden to the Thames. The watershed between the Hambleden and Wycombe Valleys is in the region of Lane End. 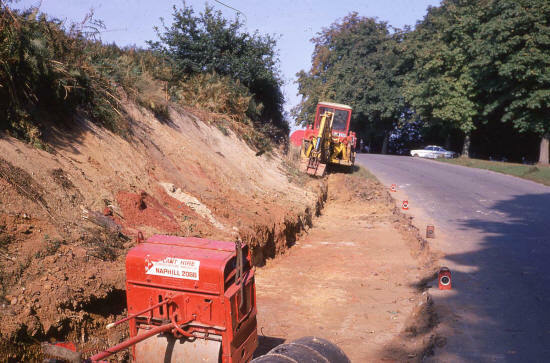 Drainage of the Ditchfield and Moor Common area is in the Fingest Hambleden direction due to the faulting mentioned above. This and also the top clay layer creates on Moor Common one of the few wet moorland areas in the Chilterns. To attempt to describe the "natural" vegetation of an area is, in any case, rather an academic exercise since man has been exerting an ever increasing influence on his environment since he first burnt a patch of scrub wood to grow crops. But, if by natural vegetation we mean the clothing of our hills in pre-historic times we may safely assume that as beech will grow on chalk slopes, the natural vegetation of our area was woodland, principally of beech on the steeper slopes and exposed chalk (hanger woods) but mixed forest in the valleys and on the richer clay soils of the plateau area, forests of oak, ash, elm, beech, hazel and thorn. Map 3 shows-the relation of Frieth to the settlements around it and is self-explanatory.